We live in a world that is designed for and increasingly controlled by algorithms. We write code that we no longer understand with effects we cannot control. 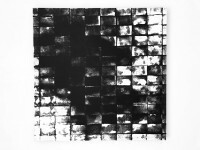 The series, ,pragmatic algorithm’ reflects the dichotomy in a superficial black and white chaos. By selectively printing different sponges a pragmatic apposition of different structural intensities of print is produced. 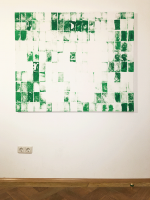 ,pragmatic algorithm' is reminiscent of an algorithmic step sequence, a succession of many side by side arranged black and white photographs, stills or sequences of moment snapshots. 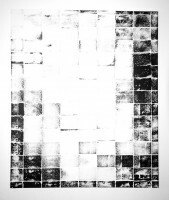 Through non-color and translucent blur it awakens memory of past images and externalizes the past. The fantasy of imagination perceives through a visual positive-negative blurred images. It creates optical illusions, a Interpretation of one's own imagination and evokes images of the interior. An algorithm is a finite number of steps consisting of a unique cction procedure for solving a problem or a class of problems. The term pragmatism (from the greek pragma "plot", "thing") addresses a behavior or actions which are conform with known circumstances, but dispense a theoretical analysis and accurate reasoning of their effects. Pragmatic action is not bound to immutable principles, and in philosophy thus known as a school of thought. According to pragmatism, it is the practical consequences and effects of life-world action, which determine what constitutes the meaning or truth. The human Practice is understood as foundation of theoretical knowledge-philosophy, since it is assumed that all theoretical knowledge has its source in the practical approach to things and relies on these. Therefore pragmatism can be used on various issues and practical contexts.